Big League Clu kicks off the Rivalry Trophy Series with a doozy from the midwest. Its officially October everyone!! You know what that means, right? The Rivalry Trophy Series is back! I am kicking off this season of rivalry games with a dandy of a trophy. It is a one that I found last season and was really upset that I did not have enough time to cover. Although it has been mostly a one-sided affair for the good part of the past 20 years. It is still a very competitive series worthy of being brought to the readers of this fine blog. Anyway, we are all set to give you what is one hell of a rivalry out of the Big 10. 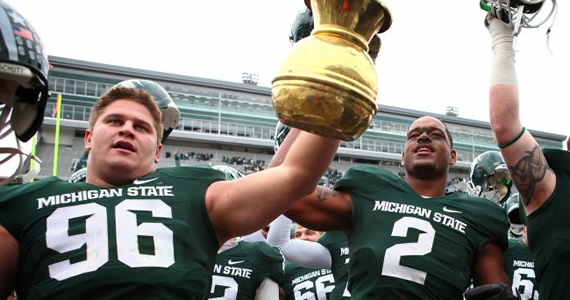 So without any interruption, I give you the battle for the Old Brass Spittoon between Michigan State and Indiana. Enjoy! Before we get into the schools that are playing for this trophy, let’s first get a history. Initially, the rivalry started all the way back in 1922, but there wasn’t a trophy to go along with it. Michigan State and Indiana didn’t play one another every year, and Indiana dominated Michigan State in three of the first four meetings between the two schools. After about a 10 year hiatus, the schools got back together and made this an annual meeting, with a trophy to go along with it. That trophy was the brainchild of one Gene McDermott, the Junior class president at Michigan State at the time. McDermott and the class secretary decided to find a trophy to give to the winner of the upcoming Indiana/MSU game. 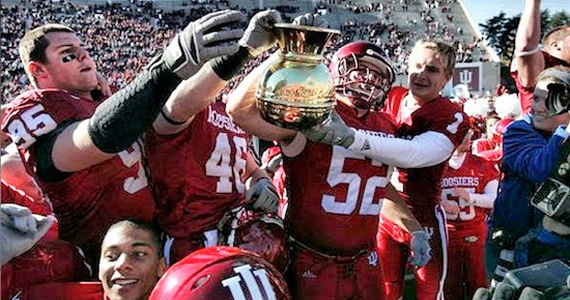 Once they purchased the trophy, a spittoon to be exact (a brass pot that you spit chewing tobbacco into – see it on The Simpsons), McDermott contacted the student council at Indiana, who accepted the challenge for this trophy. So why did they choose a spittoon? Well, inside that spittoon was a note that is thought to have been left by the previous owner. That note said that this spittoon was used at a trading post in East Lansing during the early 1800s. And, because Indiana was known for having a lot of trappers and fisherman that came to the Michigan area and used that trading post, Michigan State wanted to use a trophy that had significance for both Universities. Michigan State loved it, but Indiana seemed like they didn’t care too much for the idea at first. However, after Michigan State pummeled them 35-0, they cared, and that began the rivalry trophy game that we know today. Since 1950, Michigan State has proved to be the better school. They won 8 in a row to start off the trophy series from ’50-’58, and lead the all-time trophy series 42-12-2. Recently, MSU has won 8 of the past 9 meetings. I mean, would it kill them to let the Hoosiers win a game? We we may actually have a game here after all… Indiana is coming off of a big win vs. Penn State in Bloomington, where they snapped a 16 game losing streak against the Nittany Lions. The hoosiers also ended up getting their first conference opener win since 2000. I mean they did get a lot of help on offense. 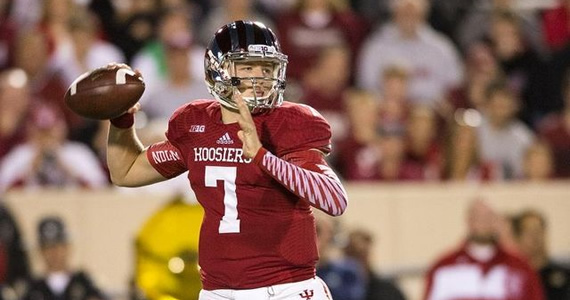 QB Nate Sudfeld threw for 321 yards and two touchdowns on 23 of 38 attempts. WR Cody Latimer caught 9 passes for 140 yards, which was his third straight 100+ yard receiving game. Their running back also got in on the mix too, as Tevin Coleman rushed for 92 yards and a score. So, all in all, they were clicking on offense. On defense, I am a little concerned, as they rank as one of the worst in the nation against the run. 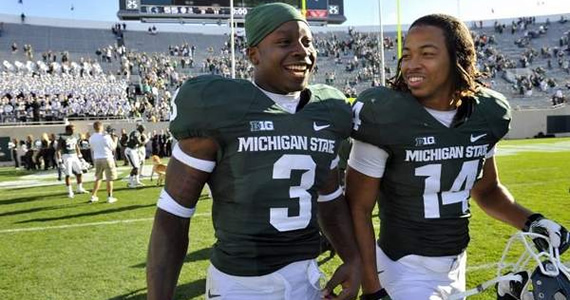 After all, Michigan State is a team known for running the ball down their opponents’ throats. Granted, IU did manage to hold Penn State’s rushing attack to just 70 yards in the game, but you have to remember that this is a severely depleted PSU team, still suffering from its Sandusky sanctions. Lets hope the Hoosiers defense can keep that momentum going for Week 7. As I mentioned, Michigan State has been known for their running game, but last week against Iowa it was the passing attack that helped lead the Spartans to victory. They actually showed a balanced offense for the first time all season long. They were led by WR Macgarrett Kings Jr., who caught 5 passs for 94 yards and a TD. However, don’t think that Michigan State isn’t thinking about this game against Indiana. Kings has gone on record stating that MSU is looking to prove that their passing attack is going to out-duel Indiana’s secondary. “We’re just looking to do what we do best — run routes, get open, show that we can be a dominant offense”. Lets hope that he can back it up on Saturday, because we all know that they will be relying heavily on their defense otherwise. I think that these kinds of games are great, especially for college football. There’s plenty of history, and some of the back stories as to how these traditions got started are great. I mean that just might be the history buff in me, but hey! I like it. Stay tuned, as I plan on taking some college football road trips as we get deeper into fall, and college football to bring you some amazing rivalry games that will be taking place. Till next weekend, college football fans!